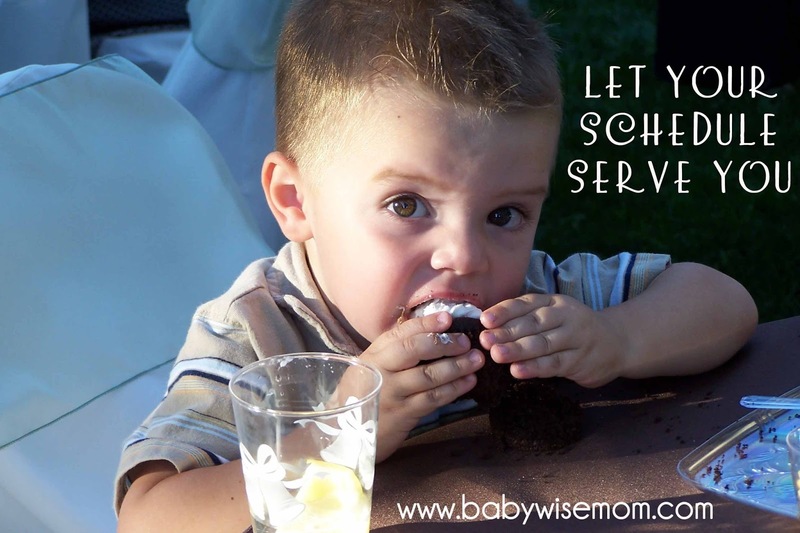 In On Becoming Babywise it says to let your schedule serve you, you don’t serve your schedule. In this post, I share my pep talk on the subject along with some examples of how this looks in real life. It is very easy to get obsessive about the schedule. With my first, I worried over it until his younger sister was born. Then I seemed to mellow out a lot in respect to what he was doing–perhaps it was because I had bigger worries in getting Kaitlyn on schedule (not that she was hard, it was very natural for her, but my worries shifted). Of course Kaitlyn had bad days. She had reflux, which makes everything harder, but she was also a human baby, and humans have bad days. While Kaitlyn was in her bad days, I would wonder if it would ever get better. My emotions got the best of me even though I logically told myself it would and I knew it would because I had been there before. Never-the-less, I stressed. 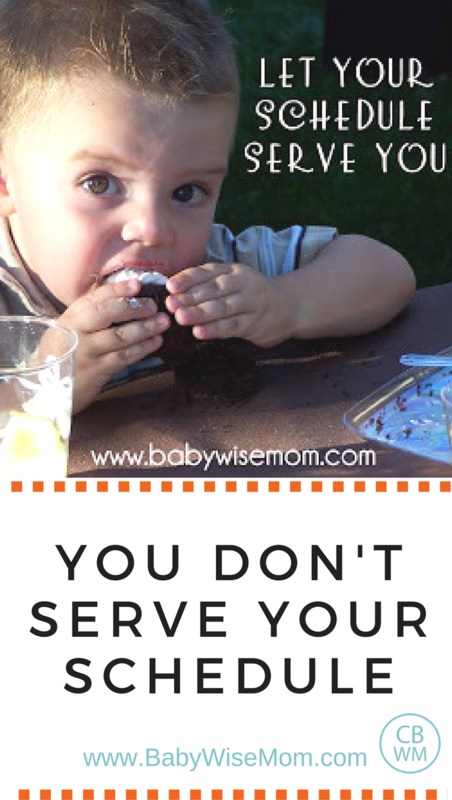 While I think it is important to have consistency with your schedule and think you have to make personal sacrifices to make Babywise work, you still have to live a life and allow your other children (and husband) to have fun. Kaitlyn did have to be more flexible since she has an older brother. Luckily for me, Brayden was still quite young and we had a really big yard, so I did not have to work a lot around the baby schedule. But you can’t quite put the lives of your children on hold like you can your own. I kept Kaitlyn on schedule as much as possible, but she had a lot of naps in the car seat for park visits, pool visits, lake visits…a number of things we just didn’t do when Brayden was that age. If she’d had a lot of disruption, I put getting her back to well-rested and calmed down the priority of the family. We compromised here and there. months, Kaitlyn took 3 naps. The last nap (in the evening) was often missed while we go out and do family things. An example from Brayden’s babyhood is his bedtime. My husband was going to school and working and didn’t get home until after 8 each day and left around 6:30 in the morning. To put Brayden to bed early meant he never saw his Daddy. That is not acceptable to me. So Brayden took a late evening nap for a long time and his bedtime was between 9:30 and 10:00. It was more important to us to have Brayden see his father each day than to have the ideal bedtime. Let your schedule serve you. My husband graduated just before Brayden turned 1 and we worked his bedtime to 8:30, then soon after 7:30. By then my husband was home by 4:30 each day and time could be spent together before bedtime. My best advice to you would be to continue on the best you can and don’t worry about whether or not things are going exactly by the book. Do the best you can, but just sit back and relax. That is what I eventually did with Brayden. I just said, oh well. This is how it is, I am going to just accept it. I was much happier about it then. I have maintained that outlook and it makes things much less stressful. I thought things through and tried to get Kaitlyn to do what she should, but I don’t sweat it. I have a friend who did the ‘oh well’ thing. “He woke up early from a nap, oh well.” Yes, analyze the situation. Troubleshoot. Try to solve. But don’t stress–move on with your life. Oh, la, la, la, la life goes on! I can’t say for sure, here are my theories.1-The book says the cycle helps baby differentiate night from day. 2-It helps ensure baby takes a full feeding. For this reason, you really want to avoid feeding right before a nap.3-The book also says it helps baby to be more alert and happy during waketime. Baby is full and rested for waketime, so he can focus on learning–his basic needs are met.4-If they have taken a full nap, they are usually really hungry when they wake up.Those are my theories. I will see if I can get more clarification on that. Thanks! I passed your question on to Anne Marie Ezzo (Gary Ezzo’s wife), and here is what she had to say.She said my theories are all fine. However, depending on the age of your son, you may not need to feed him right after he wakes up. You can wait 10-15 minutes, if he will. Like I said earlier, a lot of babies wake up and are ready to eat right away, but if he is content to wait a few minutes, it will help teach him that the minute he wakes up he doesn’t necessarily need to eat. She said, ” I have shared with mom’s as their baby is on a good routine, got this nursing thing down, milk supply is great etc. and that usually is all in place between 4 – 6 weeks, that it’s probably a good idea to have a short space of time between getting baby up and sitting down to feed, so that baby isn’t ‘conditioned’ to think, as soon as I wake up I need to eat.”If you do that, you just need to make sure you count that as part of the wake time.She also said that she noticed your address is Charleston. If it is SC, there is an active ministry for moms if you want more connection and help. Hope that helps you! I need some words of encouragement,tips and advice. The holidays are going yo be busy for me and my 7 month old baby. My sister and her husband are coming for the holidays for 2 weeks and my mother and younger will stay at my house for the 23 thru 26 possibly other days dont know yet. I am getting stressed. I already spoke to my mom and sisters about setting a schedule of whose coming who is staying sleeping over etc. My youngest tells me to just tell her went to live that she will understand but imagine me telling her: " Yeah, you can go now." Thanks for coming over.Anyways last time this happend was when Ian was 3 months old and I was the most annoying person. I was telling people : Can you guys keep it down. Lower your voice baby is sleeping, dont make too much noise or sorry we cant go right now is time for his nap…etc.I was coined as paranoid and to ecept the fact that I cannot control everything in his environment. I admitted being obsessive when I told my husband and brother in law to take the playing guitar to the other living room furthest from Ians' room. ( Its a one story home, open plan)I basically felt horrible for Ian, my guests and my husband as well as myself.U know people are in vacation and sleeping earlier than 11pm or 12pm is a bummer or cooking & eating at certain times was too much to ask from my part.This time around I am telling everyone that there will be some house rules. No cooking after 9pm or watching TV in the farthest living room from the babys room etc.BUt I cant help feeling anxious. I've been asked that for new year we go spend time at my moms house for a change of scenery and receiving the new year there which it was better than going for fire works downtown idea, I told them that I would stay there til a certain time then leave to put Ian to sleep at 7pm and that would be it for me but my husband was more than happy to take him home and spend the new years eve at home by himself to make sure Ian was in bed and well. My sister asks me why cant we keep Ian at my moms have him sleep there for the part of the evening and then take him home.As you can see I am worried about ruin it for the rest for trying to put Ians' well being first. He gets so tired and crabby when he doesny sleep. Please some advice!! Claudia, If they were coming for a day or two, I would say just relax and let things happen, but two weeks is a long time to disrupt your little one, so I think it is smart to have some ground rules.One thing to keep in mind is that Ian should be better at sleeping through stuff as a 7 month old than a 3 month old.If I were you I would either put a humidifier in his rooom or get a white noise machine or something. That way he won’t be distracted by every little noise.You could take Ian to New Year’s and put him to bed then wake him when you went home–but that would depend on his ability to adapt to things. I know with Kaitlyn that would have been no problem. With Brayden, I think it would have been hard to do.I don’t think it is too much to ask your family to respect Ian’s needs. It sounds like he might be like Brayden was. I would just tell them something like, “sorry if it is a pain, it is just that if Ian doesn’t get his sleep he gets so crabby and then he just wouldn’t be fun for anyone.Expect there to be disruptions, but do your best to keep Ian on schedule and sleeping well so he can remain a happy guy while you have visitors. Good luck! thank you for your advice. My family is here now and I am very appreciative for your advice. Hi, my name is Jana and I come from the Czech Republic. I got the book On Becoming Babywise from an English friend, who married a Czech, when I was expecting my first, Klara. Needless to say, I was very grateful for its wisdom, here in Czech it is not known at all and I seem to be the only one doing it apart from my English friend. 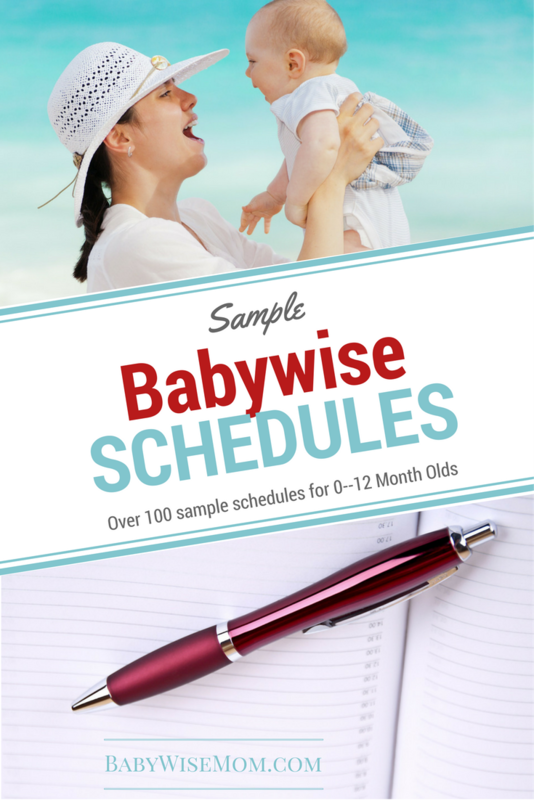 I came across your blog when I was looking for more Babywise resources on the web and your blog has been very helpful. However, I now got to the point when I need more complex advice. Please bear with me. Klara has just turned 5 month, she is a big baby (almost 9 kilos).Because we live in an apartment block I didn´t want to do the CIO for sleep training so at firt we rocked her to sleep. Bad idea – we decided to quit when she was getting to heavy and she learned to fall asleep by CIO.Luckily no neighbours complained. :-)Now I was expecting her to start STTN but no luck.Again I didnt want her to CIO because at night it would be heard much more.However,we finally did it and now she is sleeping from 10.30(dreamfeed) to 6.30-7.Yeah!My problem is that I still do 7 feeds a day and think it is too much because the last two feeds before bedtime are not even 2,5 hours apart.Do you think if I reschedule to 5 feedings until bedtime and then gradually drop the dreamfeed, she will be OK? Also she takes a long time to fall asleep for the nap before bedtime, sometimes doesn´t even fall asleep. I don´t want to let her cry so long. But she is very tired by the time she goes to bed (around 7pm).Is it OK if she just takes a catnap? What exactly is that? :-)(Sorry about my English. )One last question:I use an old baby coach on our balcony for daytime naps, she sleeps really well outdoors.I sometimes rock her in it but not to sleep.Is that OK for naps? Thank you so much for your help. I really appreciate it. Jana,If she is breastfed, it is normal to have less than 2.5 hours between the feeds at the end of the day.She is certainly old enough for fewer than 7 feeds a day. You can definitely try to take her back to 6, then 5. She might always need five, but most can go down to four at some point. A catnap for the last nap of the day is just fine. A catnap is a short nap…like a cat takes. It is typically anywhere from 30-60 minutes. If this last nap is the fourth nap of the day, she might be able to stop taking it all together and just skip a nap at that time of day.It sounds like the baby coach is okay…I don’t know anything about it. But there isn’t a BW principle that says “no naps outdoors,” so as far as that goes, there is no problem. For the earlier waking, did he drop a night feeding before this happened? That can be common if they reduce the number of feeds in the night to wake earlier in the morning.Do you give gas drops in the day? That might help.You do work your schedule with you–but that doesn't mean that you say "this is what works for me and you will conform to it." There needs to be give and take on both sides. Starting at 8 AM is really unnatural for most babies, so unless you got one of those few, it is unlikely to work for you. If your baby is not a natural 8-8 type, I would suggest you do 7-7 and then just know you will have two nights a week that aren't ideal. But two evenings a week that are off is better than 7 days a week off because you are trying to do a schedule that won't work.Not being slaves to the schedule is more about being flexible with your schedule and working with disruptions than you being unwilling to adjust yourself. You should be more flexible than a baby.I understand the desire to sleep in, I promise. I can count on one had the number of days I have slept past seven in nearly 6 years because Brayden is a natural 7 AM waker. There is just no changing that. And even when he had a late bedtime, he still woke at 7. Parenthood is not easy; it requires sacrifice. Lots of it. And lots of inconvenience and giving up things you used to enjoy…that is parenthood. I would have loved to have slept past 7–especially when I was pregnant. But what it did do is make me more responsible about going to bed at a good time because I knew 7 was coming at 7 no matter when bedtime happened for me.